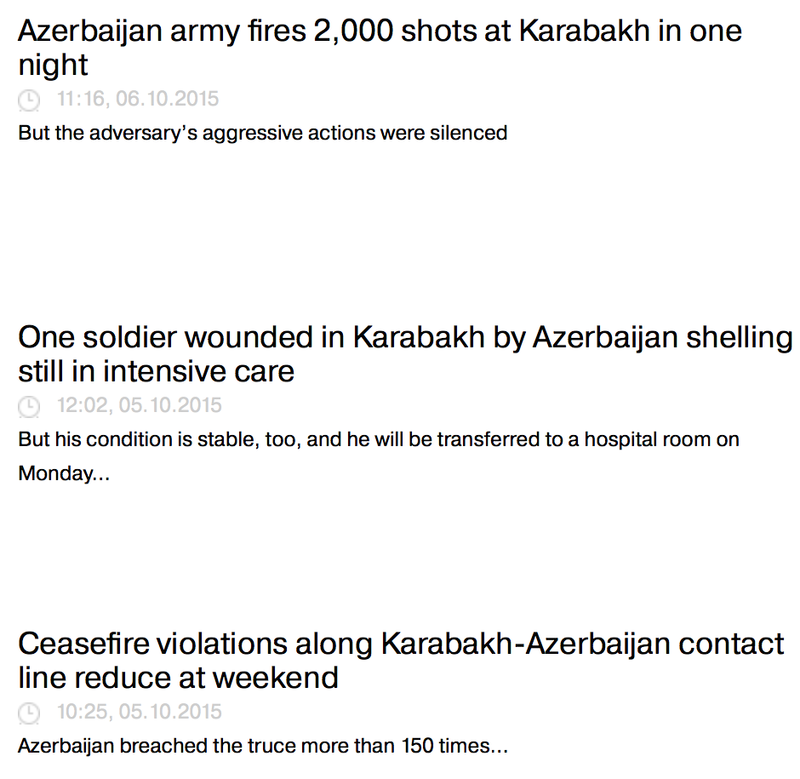 Cracking the Karabakh Conflict: Is War Inevitable? Nagorno-Karabakh, an ethnically-Armenian landlocked region located within Azerbaijani borders, has been in a state of conflict for over twenty years. Though the region is internationally recognized as Azerbaijan’s, the de facto ‘state’ has been ‘independent’ from Azeri rule since 1988 and its official status has been disputed ever since. Within the past two years, the conflict has begun heating up yet again as soldiers are killed, civilians displaced, and more advanced weaponry is brought in. Today, fighting ensues as both sides – Armenia and Azerbaijan – continuously blame each other for the conflict while other actors – primarily Russia, France, and the United States – attempt to conduct peace talks to settle the conflict once and for all. Can this conflict be settled diplomatically or will it take a full-scale war to lay it to rest? In the midst of the mountainous terrain of the South Caucasus lie still-standing remnants of buildings and homes that were reduced to mere skeletal structures hollowed out by a war twenty years prior. The picturesque rolling landscape is punctured by all of the rubble and destruction, and the sight of abandoned tanks and military vehicles dotting the hills serve as a stark reminder of its reality: through the ghosts of the region’s past, a 'dormant' conflict lives on. For the first time since the 1994 ceasefire, heavier weaponry such as D-30 howitzers are being used again in the fighting. A couple of weeks ago, beginning on September 24th, the two sides began using self-propelled cannons and salvo fire machine guns. Another concerning matter is that since 2011, Azerbaijan’s military budget has exceeded that of Armenia’s gross domestic product. This is hardly the path to a peaceful resolution. The escalation in the scale of fighting is worrying the neighbouring states of the region: Russia, Georgia, Turkey, and Iran, as if the attacks continue to grow in scale, and if communication sites were to be bombed, a full-scale war may result. Zoppellaro stated it’s “not by chance” the escalation has occurred alongside further repression ordered by both the Azeri and Armenian governments but does not believe a war will result. The solution is being monitored by the Co-Chairs of the OSCE Minsk Group, which involve representatives of the United States, Russia, and France and was established after the 1994 Russian-brokered ceasefire. Despite numerous meetings over the years involving representatives from Azerbaijan, Armenia, and the Nagorno-Karabakh Republic, the blame game between Armenia and Azerbaijan still continues and no official settlement has been reached over whether or not the region has the right to be its own independent state. Naturally, there are theories on why this conflict has remained ‘frozen’ in time for so long. One such theory is that Moscow uses the instability in the South Caucasus to keep it reliant on Russia. Other theories revolve around the energy sector in the region and resource-rich Azerbaijan. The three Co-Chairing countries continuously put out statements calling for Armenia and Azerbaijan to come to their senses, yet the blaming continues regardless. Locals of the region have grown accustomed to the fighting. In the Twitterverse, the conflict has sparked the hashtag #NKPeace as Twitter activists demand sides to come to an agreement. “People got used to the situation,” said Zoppellaro. These wounds, which are constantly being reopened by further reports of deaths on the escalating frontline as well as other skirmishes along the Armenian-Azeri border, can only be sealed by a legitimate conflict resolution. Nagorno-Karabakh is a struggle for self-determination on the Armenian side and the maintenance of territorial integrity on the Azeri side. For a resolution to occur peacefully, it is necessary for Turkey and Russia to ameliorate their own relations first in order to mend the situation in Nagorno-Karabakh, as historically Turkey protects Azerbaijan and Russia Armenia, though who protects who is becomingly increasingly blurry. Thus, the conflict may continue for years just as it is, no more, no less. Zoppellaro reiterated the hopelessness the locals feel from the situation due to a lack of strong diplomatic action. Truly, Nagorno-Karabakh is ‘the mother of all unresolved conflicts.’ Though no state involved in the conflict desires a full-scale war, it may just be the solution if diplomacy continues to fail as it has for the past 20-plus years.